Tag Delete: Select the 'Name' from the 'Shift tags' screen. 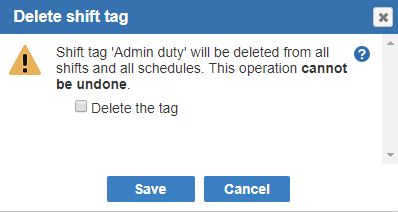 Click the 'Tag Delete' button to delete a shift tag. Confirm within the 'Delete shift tag' window to delete by selecting the 'Delete the tag' check box. Note: You can only select one shift tag at a time to delete.This operation cannot be undone.